On Thanksgiving I let an 11 year old run around with my camera while I followed closely behind. For the past few years my mom and her boyfriend bring our large families together for a 20-something person dinner including grandparents, children and friends. I've decided not to post the family photos that were taken since I didn't ask anyone there if it would be alright to use them. However, I will say letting a kid take the pictures was fun, it was great to see our new-traditional dinner through the eyes of a young girl. She was also so kind as to snap a quick outfit photo for me. Vintage tapestry purse, 1980's thrift store Abercrombie & Fitch sweater, BDG skirt, Topshop shoes. 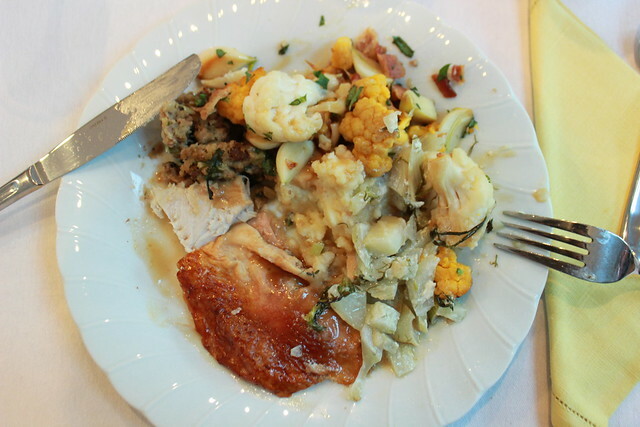 Turkey, cauliflower, fennel, stuffing, mashed potatoes. #food coma. lovely color. woo. good food! Sounds like a very fun day! Your outfit is adorable, I love the shoes & the sweater! Your dinner looks just as awesome. How can you wear all one color and look SO GOOD. Stop. Sounds like a great thanksgiving (and oh hey, looks like a great thanksgiving dinner as well because who would I be if I didn't comment on that food picture). Love your outfit! I like how you are wearing cranberry shades. 2o plus people sounds like a lot of cooking and a lot of fun. Your hair is so pretty and I looooove your purse! Belated happy thanksgiving!